Strong, experienced corporate venture capital players who have committed to participating in the growing ecosystem. While referring to the region as flyover country may still touch a nerve with some, investors in the Midwest seem to take pride in the their relatively conservative approach to backing early stage companies. This is especially true in today’s market where investors who eschewed the allure of top-line growth at the expense of everything else are starting to see their investments raise follow on funding at company-friendly terms, achieve strong exits, or build long-term businesses. 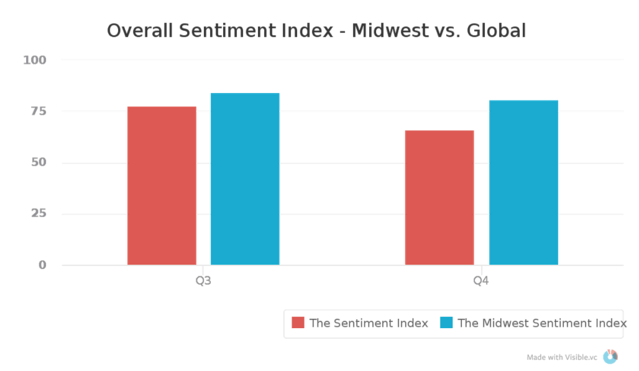 Seeing significant disparity between coastal and Midwest valuation with valuations on the coasts being about 40-50% higher, but often the quality of Companies is even higher in Midwest. A portion of this is likely born out of historical necessity, as the region lacked the robust late stage funding availability and M&A opportunities available to companies in Silicon Valley — or even next-tier markets like New York, Boston, & Seattle. In boom times, this can lead to an epidemic of “early exit disease“, as Mercury Fund’s Adrian Fortino put it, where top talent and companies flee to greener pastures on the coast. When the market turns, however, this weakness is turned on its head as companies with the ability to wean themselves from a reliance on venture capital, and have a clear path to self-sustainability have the upper hand. In many cases the companies in the best position to do this are the ones for whom raising venture capital was never easy and profitability was a goal from day one. It is becoming more and more apparent that the winners in every industry — from food, to cars, to entertainment — will be the companies that most effectively leverage technology to reach and provide great experiences to end users. To support this idea, industry vertical venture funds and accelerators have sprung up across the world. Perhaps nowhere is this more common (and potentially more impactful) than in the Midwest, a region that houses over a quarter of the Fortune 500. A robust talent network and industry-specific infrastructure are already in place. The next piece of the puzzle is capital, something that is becoming more and more available as investors are seeing value in backing companies in industries where the Midwest has traditionally stood out. With McDonald’s, U.S. Food and Kraft in the suburbs and Kellogg a 3 hour drive away in Battle Creek, MI, Chicago-based S2G Ventures unveiled a $125 Million fund to invest in companies targeting evolving consumer tastes in areas where large players have been unsuccessful – either through “brand debt” or indifference – like organic and locally produced products. Slightly earlier in the venture stack, Chicago-based Good Food Accelerator has worked to partner with large players like Whole Foods and Unfi, as well as potential financing partners like the SBA to scale farm and food businesses. Similarly in Detroit, Techstars has teamed up with the likes of Ford and Honda to fund companies focused on “mobility” that they hope will be able to leverage the Motor City’s existing expertise and infrastructure and contribute to its comeback. As the Midwest has begun building upon its strength in historically important industries, incumbent players in those industries have taken notice and have largely elected to get on board, either as acquirers, partners or investors. This is most evident in the healthcare space, where long-standing firms like Lilly Ventures (Indianapolis) and BlueCross BlueShield Venture Partners (Chicago) have continued their involvement while newer initiatives like Well Ventures from Walgreens and Intermountain’s $35 Million collaboration with Chicago-based Healthbox have added to the growth. Add to that recent headline grabbing news from General Motors (investing in Lyft, purchasing Sidecar) and it is clear that large companies in the Midwest – out of fear and self-preservation as much as anything else – are intent on being involved in the early stage markets for years to come. Featured Image via Flickr user Sergey Gabdurakhmanov under CC BY 2.0. Image has been cropped.